Priyadarshini Chatterjee of Guwahati has won the title of Femina Miss India 2016 in a grand event held in Mumbai today, i.e. 9th April 2016. Priyadarshini will now represent India at Miss World 2016. Sushruthi Krishna has won the 1st Runner-up title. The 2nd Runner-up is Pankhuri Gidwani. Pankhuri & Sushruthi may go to Miss Supranational & Miss Grand International pageants. 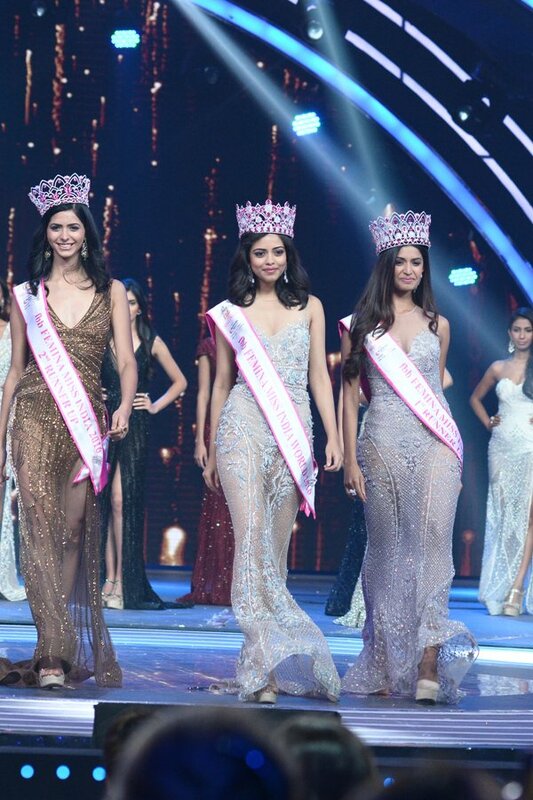 Priyadarshini, Sushruthi & Pankhuri were crowned by last year’s winners Aditi Arya, Aafreen Vaz and Vartika Singh. Priyadarshini Chatterjee has also won the title of Femina Miss India Delhi 2016. She is a student in Delhi University although she belongs to Guwahati. She defeated 20 other beauties to win the title. She also won Miss Rampwalk title. This is third year in a row that Delhi girl won the title. Dnyanda won “Miss Multimedia” and thus secured a Top 10 spot. Sushruthi Krishna won “Beauty with a Purpose” award. This was no surprise because Sushruthi Krishna’s work in “Beauty With Purpose” contest last year found a place on Miss World social media. Priyadarshini Chatterjee will be having a huge responsibility at Miss World 2016. India is always a talked country at Miss World pageant. India has already won 5 crowns. Last time India placed was in Miss World 2014 where Koyal Rana was Top 11 finalist and went on to win “Continental Queen Of Asia” title. Expectations will be high from Priyadarshini.